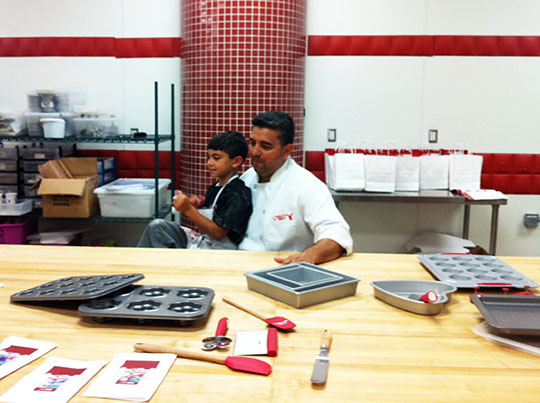 Buddy Valastro, with his son, talks about his new easy-to-use decorating tools. Buddy and his team have designed a line of Cake Boss-branded baking and decorating supplies that will be available to the public this fall. 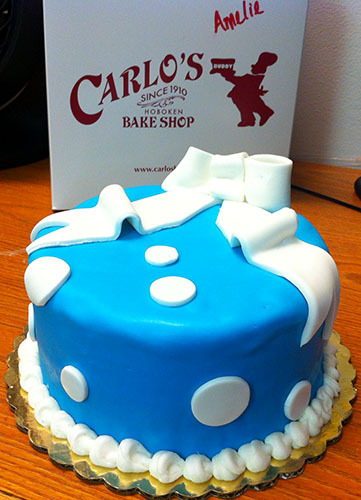 (Learn more at www.cakebossbaking.com when it launches!) These products are aimed to be easy for the lay baker to use and include things like fondant cutters and tools, cake turntables for decorating, mixing bowls, and cake pans. The idea is that anyone can decorate a great cake with the right tools. Proving this point was where we amateurs came in. 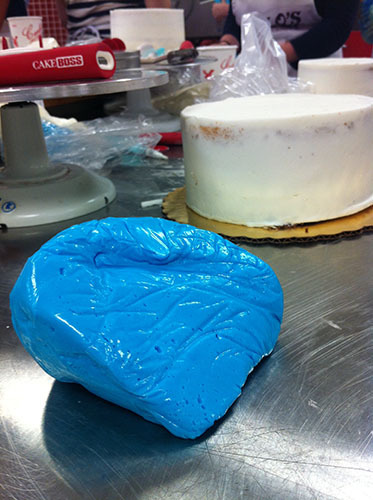 We were given fondant, tools, instruction, and a “dirty iced” cake on which to experiment. First, we rolled out the fondant. We had the help of a machine, but this can be done by hand. Covering the cake was probably the trickiest part, it is hard to get it smooth without tearing the sheet of fondant or leaving bubbles. Finally for this first stage, we trimmed off the edges with a cutting tool (a.k.a. a pizza cutter). 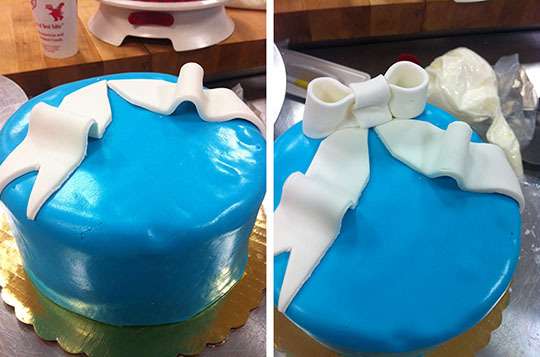 To make a bow we cut strips of rolled-out fondant with the tools provided and arranged on the cake. A little water and a paint brush worked as “glue.” We also cut circles with cookie/fondant cutters to add dots of various sizes. 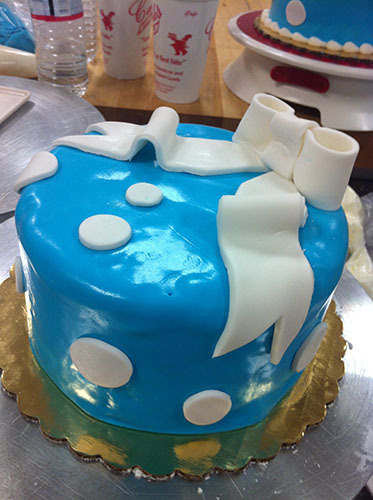 A trick, the Cake Boss-ers told us, is to steam a fondant-covered cake to easily decorate with pieces of fondant. That day, we didn’t need to use anything. It was humid enough that they’d stick right on. 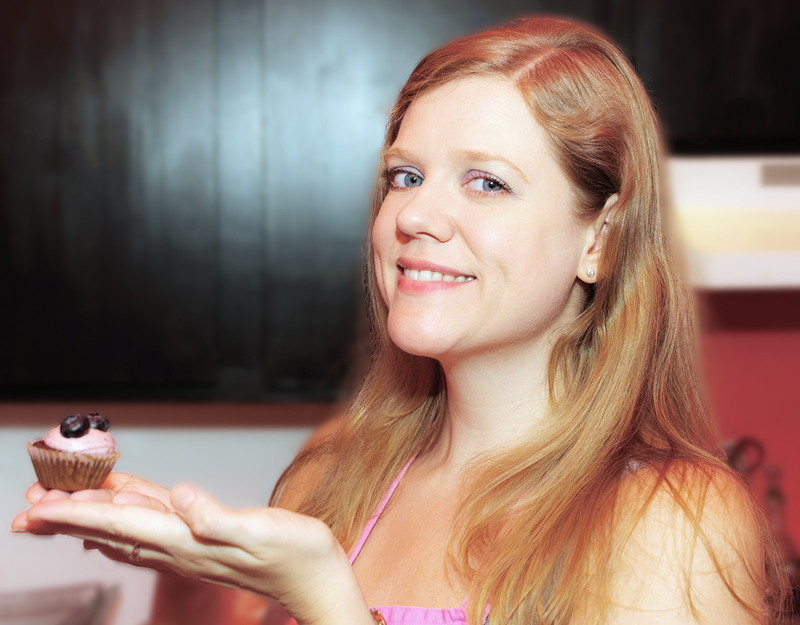 It was fun to learn to work with fondant. I don’t know that I am getting into the heavy-duty decorating game, but it’s not a bad skill to have up my sleeve! I still prefer the cake and buttercream beneath the pretty layer. 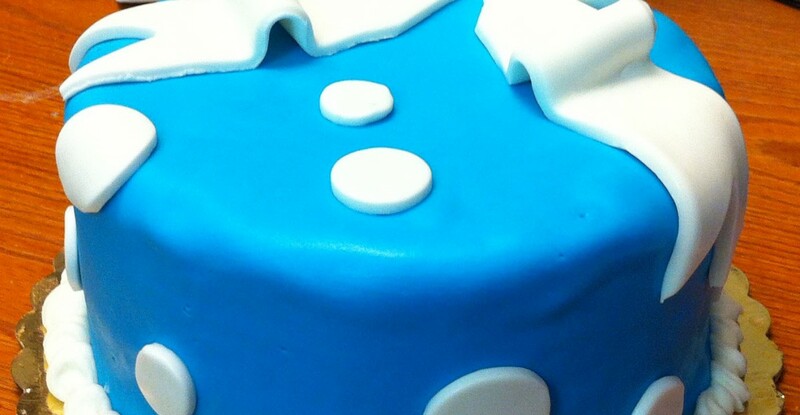 That fondant does keep the cake nice and fresh, though! Thank you to Carlo’s Bakery and JS Public Relations. Follow @cakebossbaking to learn more.